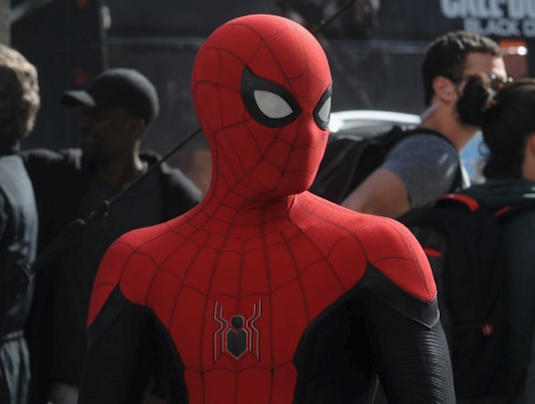 Spider-Man: Far From Home has officially wrapped shooting this past week, but fans were still able to get some last minute photos of what appears to be yet another new suit. It feels like almost every set photo we've seen from this movie has been of a new variation of the iconic costume that the wall-crawler will be wearing, but this one feels the most definite. The suit in the set photos seems to be an upgrade from the Stark suit given to Peter Parker in Civil War, but with the clear difference being the new color scheme. We have our first on screen version of Spider-Man to wear a black and red suit, which the character has worn in the comics. We also see a white symbol in the back which surely has taken inspiration from the Spider-Man: PS4 suit. Now as I said above, the suit has already drawn comparisons to certain suits from the comics with the same colors. 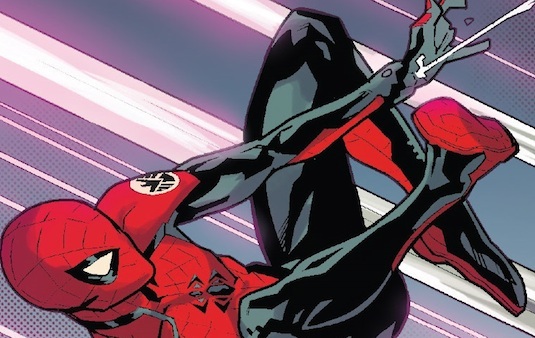 Fans will remember the recent Superior Spider-Man storyline that saw Doc Ock become Spider-Man featured a very similar looking suit. There's been mixed reaction to the departure from the traditional blue and red scheme, but ultimately I feel it gives a more mature and fresh look to the character. We still don't know if Tony Stark or possibly S.H.I.E.L.D. have provided Parker with this suit, or if he made it on his own like he does in the comics. Its worth noting the suit also resemble a S.H.I.E.L.D. Spider-Man suit recently shown in the comics, so this could be a hit they've provided him with this one as well. So far we know that the original Homecoming suit will indeed show up in the film, most likely at the beginning. We've also seen set photos of the "Stealth suit" that looks similar to the Spider-Man Noir look from the comics, and also has a S.H.I.E.L.D. emblem on it. That suit will be worn at some point when Mysterio faces off against Spider-Man as we can tell from the set photos, so its likely he was given that suit for the specific situation. 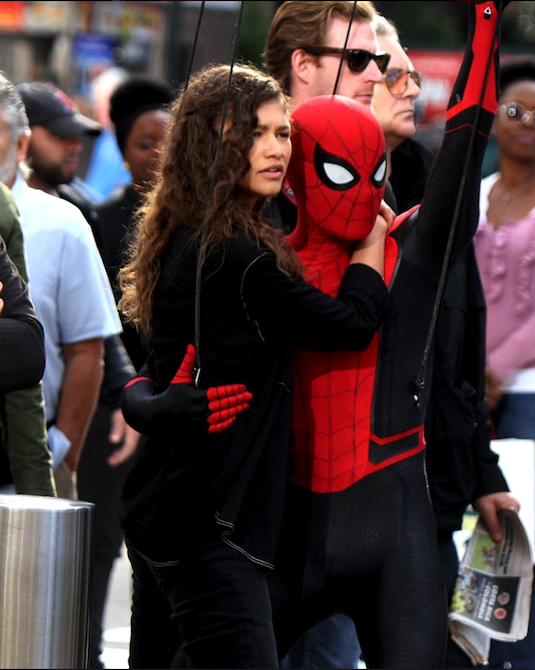 We know most of the movie will be taking place on Peter Parker's class trip to Europe, but these recent set photos with Zendaya take place in Manhattan at Union Station. It's likely this scene will take place later in the movie once Peter has returned home, and that's probably when we'll be seeing the new suit make its debut. 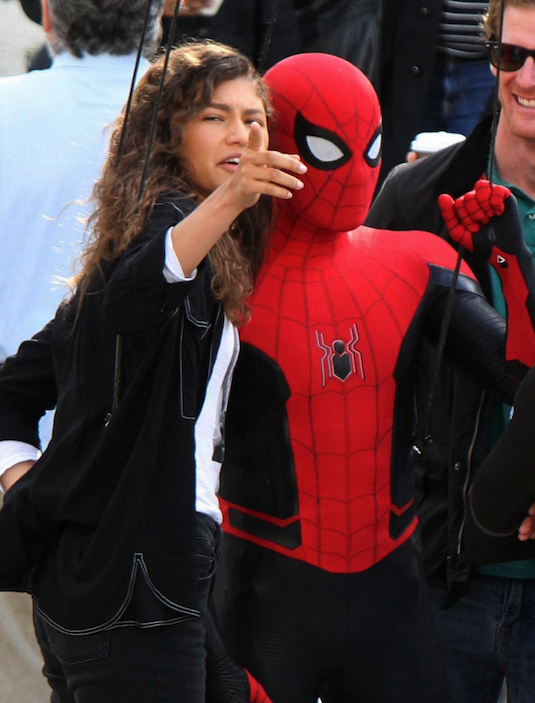 Story wise, there isn't much else we can decipher from these set photos other then that Michelle is swinging through the city with Spider-Man. Its been made apparent since the first movie that Michelle might be this universe's version of Mary Jane, and that would mean at some point she becomes romantically involved with Peter. 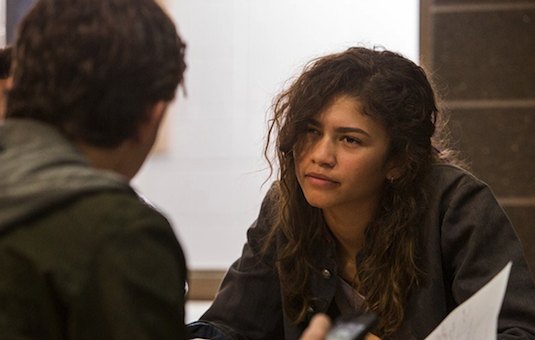 While she seemed to have been catching on to Peter keeping some kind of secret in Homecoming, its hard to tell if in this scene she already knows he's the one behind the mask. Spider-Man might just be saving her from some kind of danger, but it could also be a romantic web swinging between Michelle and Peter like we saw in the Raimi movies. So how do you feel about the new Spider-Man suit? Are you okay with the black and red? Do you think Michelle will know Peter is Spider-Man? Let us know below!